“Something was coming up behind them. What it was could not be seen: it was like a great shadow, in the middle of which was a dark form, of man-shape maybe, yet greater; and a power and terror seemed to be in it and to go before it. You fear to go into those mines. The Dwarves delved too greedily and too deep. You know what they awoke in the darkness of Khazad-dum… Shadow and Flame. 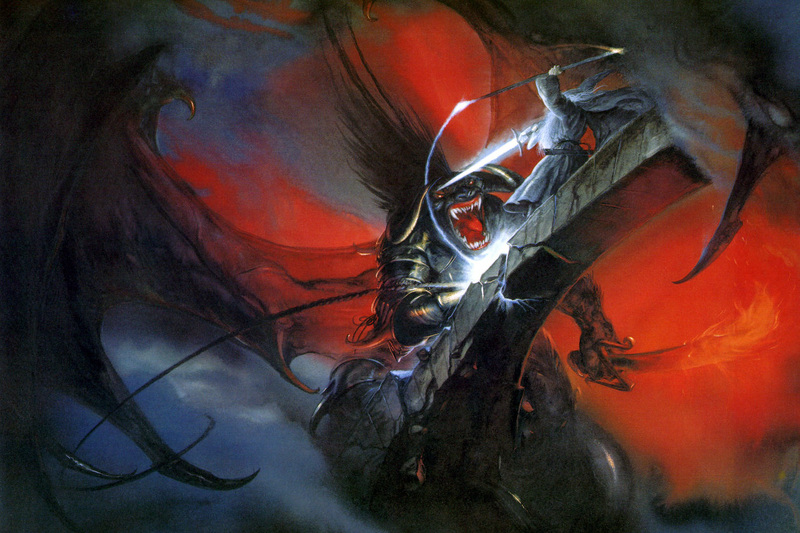 Compared to the novel, the introduction to the Balrog is greater in scope. 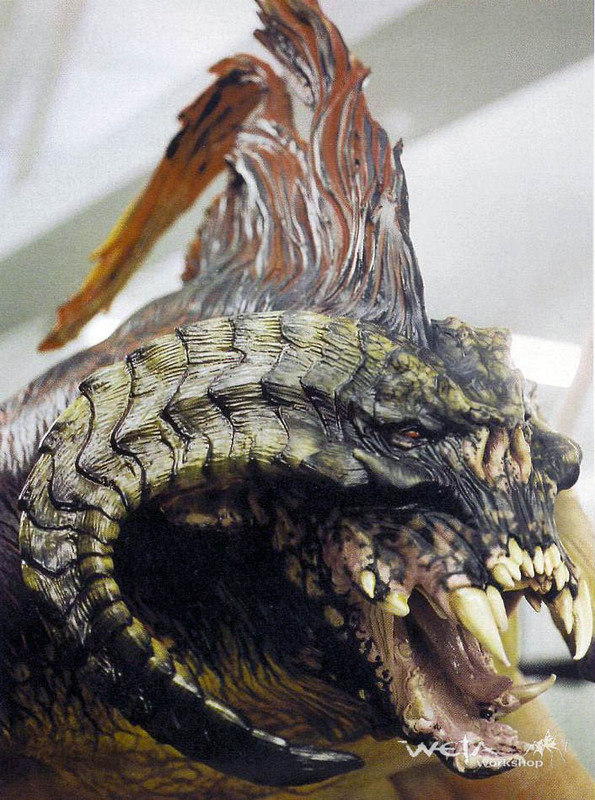 The crew designed the Moria Goblins’ armour to channel the appearance of the Balrog, implying that they worship it as a deity. In addition, as Durin’s Bane approaches the scene, the photography of the film leans towards progressively warmer colours. 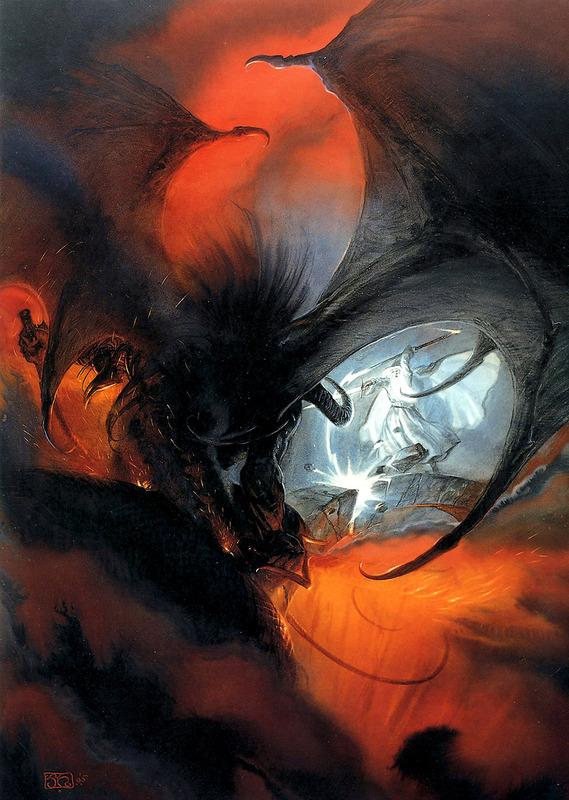 One of John Howe’s original illustrations. Concept art by Ben Wootten. “[…] His enemy halted again, facing him, and the shadow about it reached out like two vast wings. It raised the whip, and the thongs whined and cracked. Fire came from its nostrils. But Gandalf stood firm. 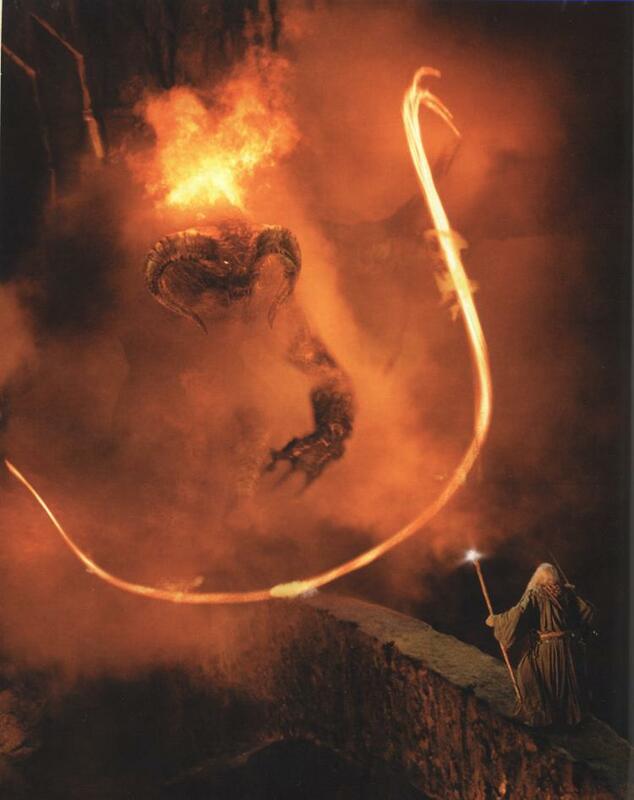 The Balrog’s look was ultimately developed progressively through a series of conceptual maquettes. 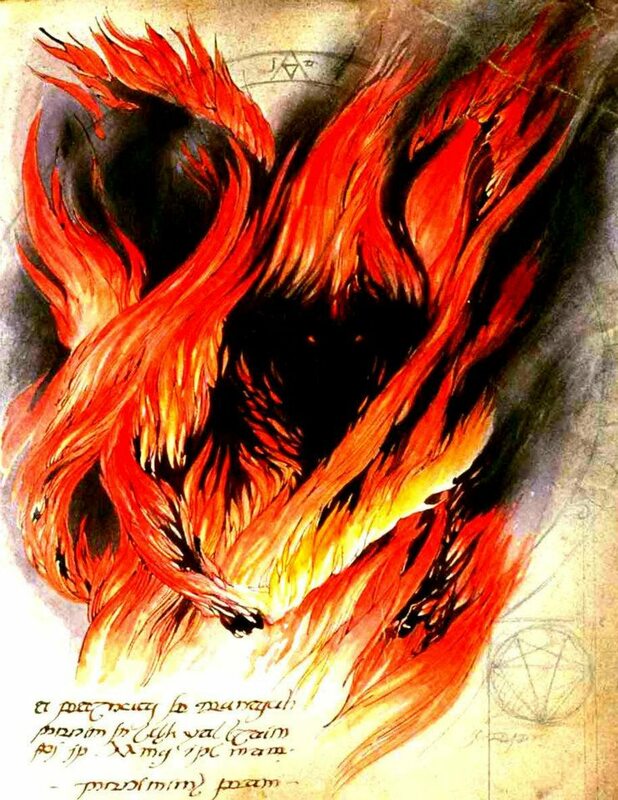 Given it would obtain its ethereal appearance through digital enhancement, the Balrog also needed to be a reality-based form. Ben Wootten was the artist with the most influence in the process, being responsible for the final iteration of the design. Visual effects supervisor Richard Taylor said: “its skeletal structure was a mixture of a dog and a bull, with wings based on the structure of bat wings. It had the tail of a lizard, and its horns were fashioned to look like actual horn material.” The 4′ tall maquette depicting the final design’s head and torso was sculpted by Wootten himself and Jamie Beswarick. 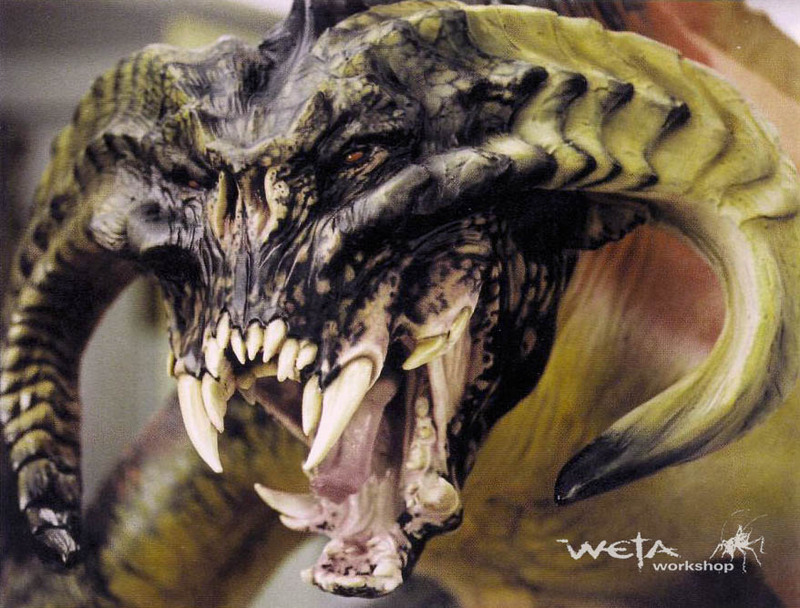 Gino Acevedo’s initial colour schemes for the Balrog were based on dark but organic, animal-like patterns. However, it was ultimately established that Durin’s Bane would be a fantastic being composed of lava, taking into consideration that the Fellowship encounters it deep within a mountain. Most importantly, this expedient also resolved the question of how to convey the “Shadow and Flame” description. Scenographer Grant Major said that the demon “appears to be made of fire, of lava almost. It’s as if the environment it is in, the base of the mountain, because it is volcanic, infused in this fiery monster.” Taylor added: “the skin just happened to be congealed, cold lava. By basing it in this physical reality, the audience could believe in this fantastical, bizarre creature.” Wooten’s maquette was finally scanned to obtain a rough digital model, which was then refined manually and completed with the rest of the Balrog’s anatomical components, such as the wings. The next challenge was to properly convey the lava-like texture of the Balrog’s body. As envisioned, the Balrog’s outer surface acted like solidified lava, containing the creature’s innards — molten lava. Taylor elaborated the concept in the commentary for the film: “we very much wanted the feeling that the surface of the Balrog was like congealed lava, and that if he [remained] still for a long time it would turn completely black — but through his actions, the lava would split, revealing a more molten mass of heated lava underneath the skin — as if his skin is running with liquid veins of heat and fire. His eyes glow like white embers and when he roars, the heat wave flows out of the inner forms of his body, where this massive energy is stored. 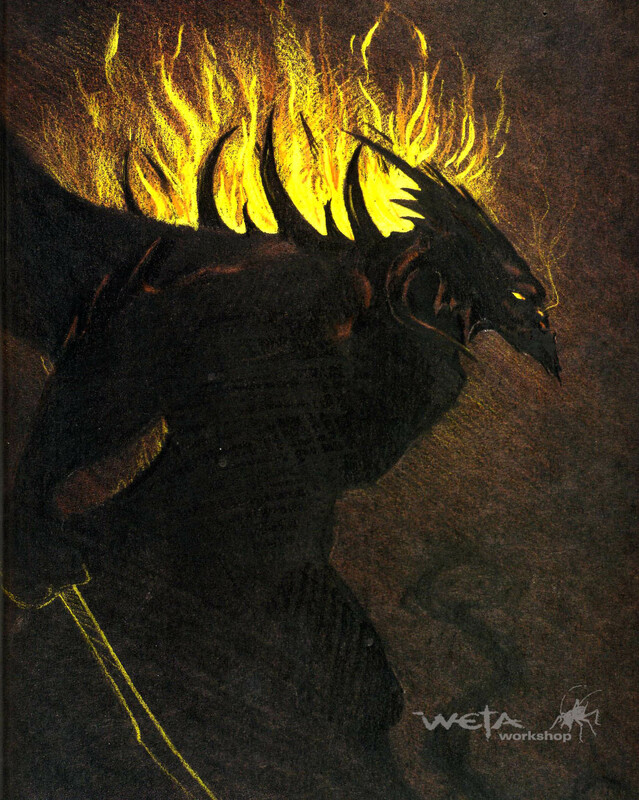 We wanted his back to erupt into this huge flaming furnace as if all the energy is pouring off his back like a huge mane; and his wings are almost like shadows of smoke writhing around him.” Gray Horsfield also described the Balrog’s skin moving “like tectonic plates”. The Balrog’s outer surface was defined and texture-painted by Paul Campion and Rob Shrider. Technical director Jim Callahan initially devised a complex physics-based fluid dynamics system and volume renderer; it was discarded because it was deemed as ‘too render-intensive’, and the fire produced with it did not behave dramatically as Jackson intended. After failed experiments in puppeteering actual gas jets, the crew settled on a combination of practical and digital effects — a system developed by Gray Horsfield. He explained: “I did a test initially, which was just a single, blobby little cell-shaped thing moving down a slope. It was on fire and it was burning. I did that using sprites, which are basically just pictures on particles. […] For the Balrog, we shot fire — explosions and propane tanks going off, flames billowing and curling around — and then we put those pictures on fairly rudimentary Maya particle systems. Each particle was a picture of fire doing its stuff. We did the same thing for smoke. In both cases, the pictures were animated, not just still, so they would evolve over time. There were a lot of these little sprite projections going, synchronized differently, and we layered them together until it looked appealing. We added fire where we felt we needed it, and took it away where it didn’t seem to be working. So basically, we were just utilizing Maya as a compositing package to reposition the pieces of fire so that they were in the right place and moving the right way.” This process considerably quickened the rendering process, allowing the crew to render two frames per second. ‘You cannot pass! ‘ he said. `Gondor! ‘ cried Boromir and leaped after him. For more pictures of the Balrog, visit the Monster Gallery. Posted on 19/12/2016, in Movie Monsters and tagged Balrog, John Howe, Peter Jackson, The Lord of the Rings Monsters, Weta. Bookmark the permalink. 1 Comment.